Australia’s mining industry will become the world’s number one again over the next two decades, attracting as much as 18 times the investment planned for South Africa, according to the latest report from Deloitte. In Tracking the trends 2013, Deloitte’s fifth annual global mining report, the experts said Australian miners can leave behind the gloom and doom of 2012 and look forward to a much more promising future. 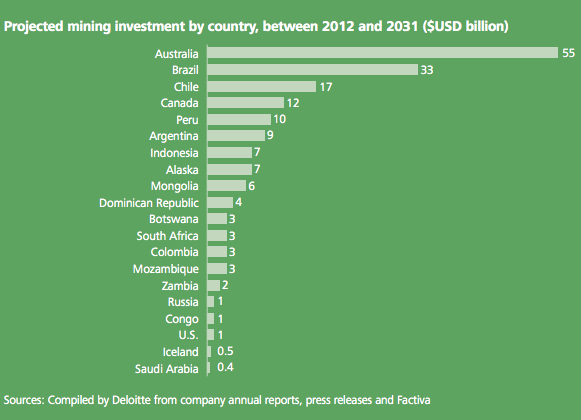 Deloitte’s analysts expect mining investment in the Down Under to reach $55 billion between 2012 and 2031, which is a much higher figure than what South America and South Africa, the other two main mining districts will get. Brazil, for instance, which is home to Aussie’s largest iron ore competitor Vale, is expected to attract $30 billion over the period. That country is followed by Chile, which will receive about $17 billion in the next two decades. 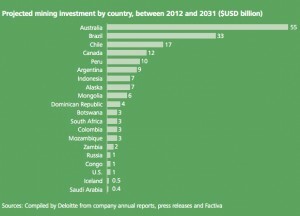 South Africa’s mining investment is projected to reach only $3 billion between 2012 and 2031. While the report acknowledges that costs will remain a problem for Australia, it also says that miners in South and North America are expected to post higher overruns on their projects.